To be published in Githa Heggde & G. Shainesh (eds.) 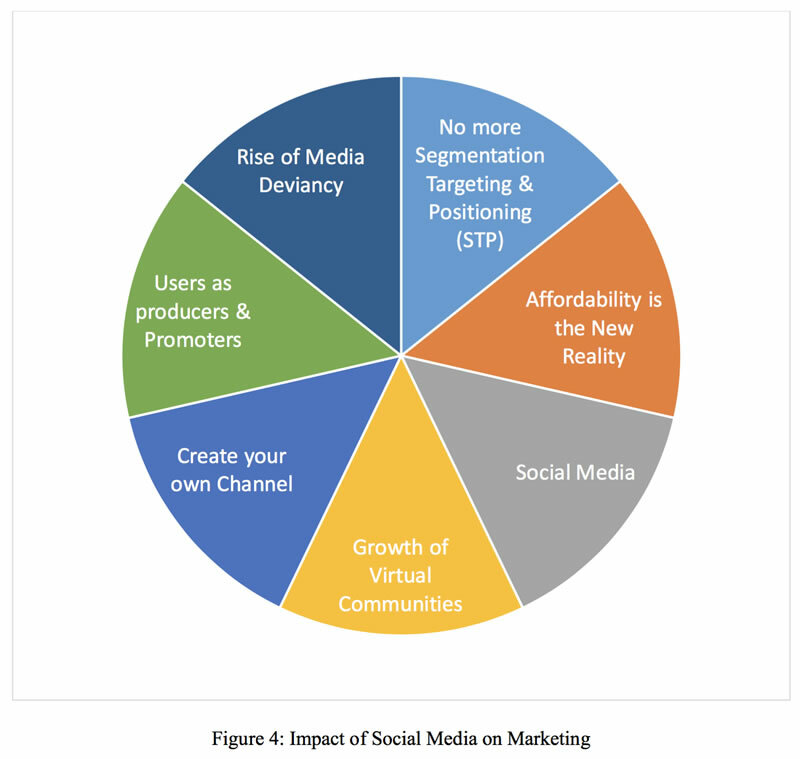 Social Media Markets: Emerging Concepts & Applications Sage Publications, India (In Press) *The author is grateful to Racchit Thapliyal for his excellent research and editing assistance for this paper. The world is changing; technology is ubiquitous and it is impacting society with each rapid change it undergoes itself. If we were to return a few decades into the past, television was the most exciting technological development, and it transformed society in an unprecedented manner. Today, we’re seeing a similar transformation via the Internet and the rise of Social Media. In fact, Social Media is poised to transform society in an even more fundamental manner. It is easy to underestimate the true disruptive potential of Social Media— a moving target which is hard to pin down due to constant innovation. For example, as a consequence of the widespread adoption of Social Media, the distinction between the public and private spheres of life are quickly eroding. Whether one is a CEO, the President of a country, a member of the British Royalty, or a common person, everything about one is on Social Media – personal information, likes and dislikes, or other mundane activities. In fact, everything said or done is now a matter of public record, and nothing can remain hidden anymore. Besides the doom and gloom surrounding Social Media because of this lack of privacy, however, there is a bright side as well- Social Media has led to a drastic increase in transparency in society. The focus of this paper shall be on the impact of Social Media on Marketing Media. Traditional media, consisting of Print, Radio and Television, offer what can be called a “Shotgun” approach- they represent one to many, passive communication. Therefore, in order to achieve efficiency and effectiveness, Segmentation, Targeting and Positioning strategies are utilized. Social Media, on the other hand, are interactive in nature- they represent peer to peer relationships, or what is referred to as many to many, active communication. Additionally, since Word of Mouth (WOM) is so crucial in marketing, the paper will also discuss how traditional WOM influence will change dramatically in the world of Social Media. 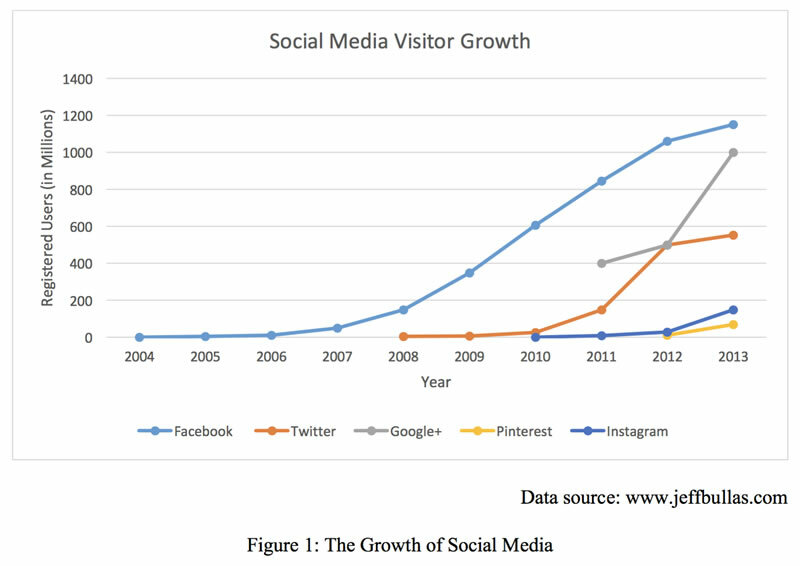 Social Media is a blur of “likes,” “tweets, “shares”, “posts” and content (Bullas, 2014). Its use is not limited to the youth. Rather, it is universal and embedded in every corner of the web. The numbers are staggering: 72 percent of the all internet users are now active on Social Media (Bullas, 2014). 89 percent of the people between age bracket 18 to 29 use Social Media. 82 percent of people between age brackets 30 to 49 are active on Social Media. 65 percent of 50 to 64 year olds use Social Media, while in the 65 plus years age bracket 49 percent are active users (Pew Research, 2014). It is clear that regardless of their age, people are now spending a lot of time on Social Media, constantly sharing and browsing information. When it comes to geography, it is US citizens that top the list of time spent on Social Media, at 16 minutes per hour spent on the Internet. Australians follow them at 14 minutes and British at 13 minutes (Experian, 2013). The use of mobile technology to access Social Media is also increasing rapidly, with 71 percent of the users of Social Media using mobile devices to access it (Bullas, 2014). Currently, Facebook is the “biggest kid” on the Social Media block, with 1.49 billion Facebook users (Statista, 2015) and more than 100,000 webpages are accessed with the ‘Login with Facebook’ feature (Lafferty, 2014). 23 percent of the Facebook users login at least 5 times a day (Romeri, 2014). Facebook also has a lot of influence on the buying decisions of customers, as 47 percent of the Americans say that Facebook is the number one influencer of their purchasing habits (Romeri, 2014). Since Facebook has so much influence on people, it isn’t surprising that 94 percent of B2C marketers and 82 percent of B2B marketers today use Facebook for customer acquisition (Stelzner, 2014). Other popular Social Media platforms include WhatsApp, Instagram, Snapchat, Pinterest, LinkedIn, YouTube, Vine, Tumblr, and SlideShare – with their impressive user base, these are also gaining more and more attention from marketers. What follows is a discussion of the WOM phenomenon in, both, its traditional context and on Social Media. Specifically, the emergence of WOM, its impact on marketing, and other characteristics are considered in both contexts. The origin of WOM communication can be traced back to the origin of trade itself. It was most powerful in the agriculture age, where the producer and consumer interacted closely. The milkman who delivered milk to one’s home, the butcher who delivered fresh meat daily, and the grocery store delivery person knew everything about the family and their preferences. The services they provided were characterized by much more than a mere transaction of goods. One confided in these goods and services providers; they knew the family dynamics, and were even privy to their finances. In fact, the grocery storeowner often acted as a money-lender to the family if they didn’t have money to pay for the groceries at the end of the month. This financing service would be underwritten by the “good name” of the family— something akin to the modern credit score. This was a multigenerational relationship, with the children continuing to avail of such services, and even taking up unpaid family debts. With the dawn of the industrial age, however, came the separation of production from consumption, and the rise of middlemen and of trading. 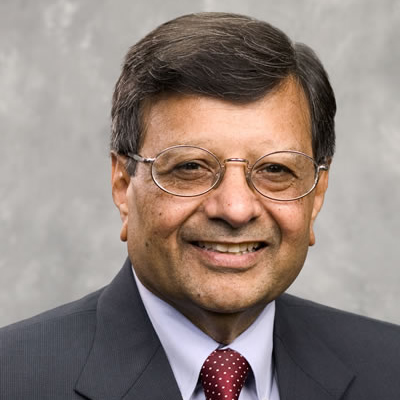 As a result, the economy became more transactional as opposed to relational as it had been in the past (Sheth and Parvatiyar, 1995). Counterintuitively, Social Media is bringing us back to that bygone agricultural age. In those days conversations were “recorded” by the barber and hairstylist who knew more about anything and anyone in the community. People discussed politics and their religious beliefs at the local diner where everybody got together. It was here that they also discussed community events and what was happening in their lives as well. With the rise of Social Media, we are back to recording conversations today, albeit digitally; and this time it is more tangible and permanent as (almost) nothing is erased from the web. The explosion of Social Media services over the last few years continues to have a significant impact on advertising, as consumers’ reliance on word of mouth in the decision-making process – either from people they know or online consumers they don’t – has increased significantly. 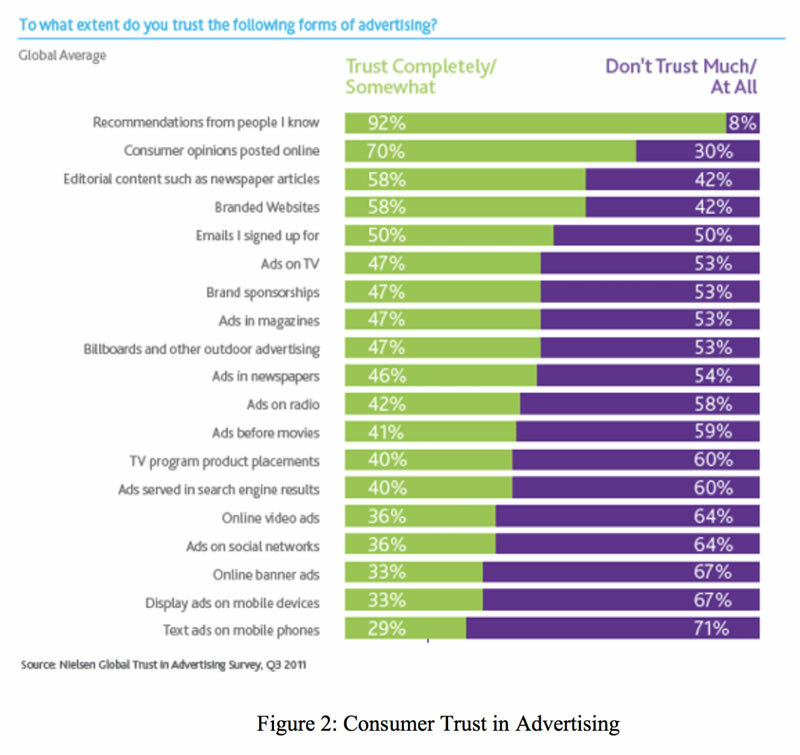 According to Nielsen’s Global Trust in Advertising report issued in 2012, 92 percent of consumers around the world say they still trust earned media, such as recommendations from friends and family, above all other forms of advertising—an increase of 18 percent since 2007 (Grimes, 2012). Online Consumer Reviews are the second most trusted source of brand information and messaging, with 70 percent of global consumers surveyed online indicating they trust messages on this platform- an increase of 15 percent in four years (Grimes, 2012). 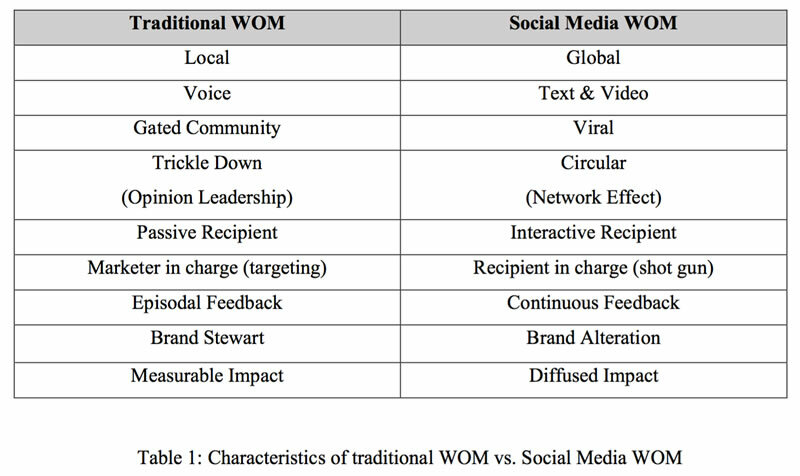 Today, we can gauge a significant increase in the impact of WOM on Social Media. Now, let us turn to an overview of the WOM phenomenon in the traditional context as well as on Social Media. Traditional media refers to conventional means of mass communication, such as street theatre, television, radio, newspapers, magazines, newsletters, tax press and other print publications. Traditional WOM is limited to a local impact. This form of publicity takes place on an ongoing basis when people attend to their daily chores. For example, it is at a park, salon or supermarket that people are most likely to have conversations about their experiences with and expectations from any product or services. Publicity here, whether good or bad is limited to particular communities that are formed at particular places. And hence, WOM is local and lies within a “gated” community of neighbors. The medium is primarily voice, where one’s experience is being referred to by every other member within the community- there is a trickle down-effect of one opinion to several recipients i.e. a one-to-many relationship. A key influencer will influence every other recipient here. Thus, WOM here is driven by a single opinion maker, with the rest being passive recipients to it. This is reflected by the theory of diffusion where a handful of opinion makers in a community influence the masses. For generating WOM publicity via traditional media, the marketer is in-charge of targeting the right audience with the right message about the company or its product and services. The feedback in this case is, thus, episodal in nature, where market research is primarily done periodically (for example, a particular AC Neilson dataset). The brand is very closely managed in this case. Marketers are extremely particular about their trademarks and logos, so that the brand’s perception is the same and remains intact in everyone’s mind. All the more, the impact of WOM is easily measurable in this case. Social Media is highly interactive in nature. In fact, the more the number of interactive recipients, the more the number of opinions. Here one sees a network of influencers—a many-to- many, peer to peer relationship (as opposed to a one-to-many relationship in the case of traditional WOM). If one communicates with another, the other in turn is both influenced and influences the sender- there is no opinion leader and laggard. Thus, WOM in Social Media is circular in nature and effectively builds a network effect. Network of different opinions are formed, giving a better picture about the brand to the recipients. 3.4.1 Who is in charge? Unlike traditional WOM, the recipients are in charge of generating WOM on Social Media. The marketer need not identify the target demographic and then communicate or design the product accordingly. Rather, they could simply devise the product and “throw” it or disseminate it widely on the web. Somebody will buy it, but the marketer would not have a pre-existing idea of who the customer or user of the product or services will be. Consequently, the traditional concept of market segmentation, targeting and positioning is obsolete here. A promotional campaign for products or services on Social Media covers as wide an area or population as possible, i.e. a shotgun approach. Then, it is up to the recipients to initiate, build and hold conversations about them on Social Media. The conversations are not limited to a certain group of people for a certain time period; rather, they are open for anyone to react to, give feedback and modify. This means the marketer must constantly react to the feedback on Social Media. Thus, we have a continuous feedback cycle. People also express themselves by their possessions (Belk, 1988). In the digital world, one can create one’s own avatar and collect digital possessions (such as trophies on Sony’s PlayStation network) and, thus, there is not a need for physical objects to get happiness or enjoyment (Sheth and Solomon, 2014). Virtual communities such as Farmville have formed online, and about eight million people log in to it daily- one rushes to milk one’s cow in time (Sarkar, 2012). That is the nature of the virtual world, where the concept of kinship is almost extinct. People no longer meet their family or neighbors in person. Rather, people are moving towards virtual friendships on Social Media. The telephone had a similar disruptive effect in the past- one could call one’s neighbor over the phone, and talk to one’s friends and relatives across the country. The telephone thus, displaced conversations in person due to sheer convenience. Social Media is likely to give rise to brand alteration. Consumers can take liberty with a brand and the company will have a hard time enforcing its intellectual property rights. In the worst-case scenario, there is a possibility of the brand alteration going out of control. This in turn would have an impact on marketing, advertising agencies and brand management in general. This impact will be nonlinear by nature and diffused, and, thus, may not be easily measured. And this, in turn, could create anxiety amongst the marketers. What we have, essentially, is a black box scenario. This is the nature of the diffused impact of WOM on Social Media. 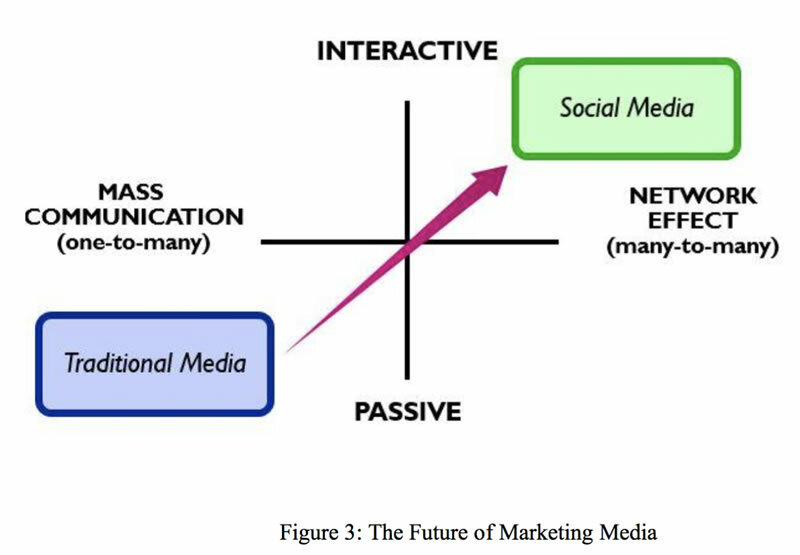 There are two shifts on marketing media due to the rise of Social Media. First, from Mass Communication (one to many) relationships, marketing media has shifted towards the more apt and convenient Social Media (peer to peer network) relationships. Second, traditional media are passive for the audience whether it is print, voice or video, while Social Media is more interactive. Traditional Media is firmly situated in the one-to-many paradigm- It follows the broadcasting model, wherein it transmits the message it wants to convey through either broadcast television, print, radio or signage. Traditional media is, thus, limited in creating engagement as is done by Social Media. With the shift to the more interactive Social Media, marketers are now adopting digital marketing tools to market their products and services anytime, anywhere and anyhow. Where traditional marketing was limited by location and time, digital marketing has effectively removed these hindrances to present itself as a hassle-free marketing tool. One of the most important concepts in marketing is Segmentation, Targeting and Positioning (STP) for any product/brand. Together, these enable a marketer to: a) Determine the different types of customers, b) Select one of the group of customers that can be served best, and c) Communicate with the targeted group in the best possible manner. It is, hence, a “sniper” approach, because a “shotgun” approach can prove far too expensive and inefficient when marketing via traditional media. In the digital age, however, a product/brand has a worldwide reach. The internet is also a very rich and affordable medium. Therefore, the aforementioned factors do not play as much of a role as they did in the past. Thus, traditional marketing is now being replaced by the more cost effective and result-oriented digital marketing. Accordingly, the question arises whether STP will still hold ground or will it lose importance in a world where market players are able to communicate about their product, and also sell their products across demographic or geographic boundaries. Many e-commerce companies, including Amazon and Ali Baba, have amply demonstrated this. The idea of a “relevant” target market is somewhat obsolete. For example, an Apple iPad is being used by everyone – from a 5-year old in the Unites States to a 60-year old woman in India. Hence, following the traditional STP tool for marketing might not be beneficial to the next generation of companies. Social Media has also disrupted the paradigm of production and the cost of distribution. In the realm of entertainment, or filmmaking to be specific, a person today is not as dependent on a producer or a director anymore. A good storyteller is now capable of producing and directing a film of reasonable quality in a quick span of just 2 to 3 months, enabled by the hardware and software platforms of Apple and SONY, both of which have been highly affordable and produce good quality digital films. Similarly, in the realm of book publishing, we find that authors today are increasingly choosing to self-publish. Today, a small merchant can scale upon its marketing and offer products and services globally. Internet is both a rich medium and it has global reach. Social Media Addiction (SMA) refers to a state of mind where a person feels the constant urge to keep track of their Social Media existence. Though it is not yet recognized as such, this might very well be termed a mental disorder due to which a person feels a compulsion to constantly check for Social Media updates, or even “stalk” other people’s profiles, amongst other things. Any kind of addiction is likely to be harmful to a person’s mind and body. Researchers at University of Chicago have recently concluded that SMA can be stronger than an addiction to cigarettes or even alcohol following an experiment in which they recorded the cravings of several hundred people for several weeks (Hoffman, Vohs and Baumeister, 2012). SMA is becoming so common that it is having an impact on social demographics— families are struggling with maintaining relationships, as a lot of time is being consumed by their “social” lives. Companies are now targeting consumers with “app-only” strategies and are cashing on the idea that since smartphones are constantly being checked by users, this can be converted into revenue. In order to fight this addiction, it is generally advised by experts that consumers should limit the number of apps on their phones, and parents should keep a check on their children’s smartphone use. The “real estate” on the smartphone will have a premium just as we have at retail store shelves. There are, however, some people who contradict the characterization given above. Their point is that despite the fact that people are not interacting face-to-face, Social Media still remains a platform that facilitates widespread human interaction, which is normal and shouldn’t be termed as an addiction of the mind. Whatever one’s view on the matter, Social Media is indisputably a very addictive medium. Addiction of the mind is very different from addiction or consumption of physical objects. We have a certain depth of knowledge as far as reducing the addiction of consumables such as alcohol and tobacco is concerned; however, we need to still learn how to effectively control the addiction of “mental consumption” brought by about by Social Media. Digital- detoxification and digital-rehabilitation might very well be matters of real concern for the future generations. A rise of Virtual Communities can also be observed across the digital world. A Virtual Community is a social network of individuals who interact through specific a social medium on topics of mutual interest, potentially crossing geographical boundaries. Society has been observing a gradual shift from kinship-bonding to friendship-bonding. The virtual communities range in activities from forming friendships, learning new subjects, obtaining opinions on purchases to human experience in general. Earlier, people had a very limited audience to help them answer their queries, but today the audience is unlimited; anyone can find someone to help them solve an issue. People are no longer connected by the proverbial six degrees of separation- this has been reduced to just one or two degreed of separation in reaching someone by name and location. Companies are leveraging this opportunity to target audiences. For example, there was a time in India when marriages were arranged with the help of relatives and one’s immediate social circle, but today matrimonial websites are giving families an opportunity to expand their social circle and, yet, stay within the boundaries of religion, caste and creed- criteria that continue to dominate the Indian marriage market. In China, Wang Hun or online marriage is a phenomenon in which people become friends online, then become online lovers and, finally, have an online wedding, without meeting in person. This concept is challenging the sanctity of marriage in society, something that has serious consequences on the wedding business. In the long run, more and more people might prefer this type of arrangement over the real experience of a physical wedding due to sheer convenience. There are thriving virtual communities such as Second life and Farmville which let users access a virtual life, and satisfying real human emotions and desires in the process. Professional executives have been known to rush home to milk their virtual cows in time on Farmville. These virtual communities are satisfying human emotions up to an extent that people are gradually shifting towards an atomistic or autonomous lifestyle from the earlier nuclear (family of four) lifestyle. This atomistic lifestyle is mostly followed by people with a self-serving and self- sustaining mind set. Whether this phenomenon creates new opportunity for marketers is yet to evolve. Also, we don’t know if a highly atomistic lifestyle makes one prone to impulse buying and consumption. With the growth and near universal availability of high bandwidth, broadband internet connectivity and other growing technological and communications infrastructure, any individual today is empowered to put his message out to a larger audience. In fact, one has the ability to create one’s own media channel rather than depend on traditional media such as newspaper, radio, or television to transmit their message. One has the ability to take control of the entire process of production and dissemination in their own hands. Over the years we have seen the rise of bloggers, the “twitterati” and other social influencers who have emerged as celebrities in their own right. YouTube has clearly demonstrated this- It is very easy to create and manage one’s own YouTube channel, as is evident by the presence of celebrities, athletes, religious leaders like Pope Francis and political leaders like US President Obama and Indian Prime Minister Narendra Modi. This democratization of media has also enabled citizen activism. On January 25, 2011, Egyptians started organizing protests against their government and their long-standing leader, President Hosni Mubarak, through Facebook and Twitter. On a global level, not only has media been democratized by the advent of Social Media but, conversely, Social Media is also being used as a tool for democratization. Be it the Filipino demonstration against their President Joseph Estrada in 2001 or the Jan Lokpal Bill struggle in India, Social Media is helping change the political scenario worldwide. It has the potential to encourage public policy intervention, as demonstrated by the Maggi quality issues in India and the recent Volkswagen scandal regarding fuel efficiency. This has been made possible due to the easy accessibility of a platform where people can raise their voice in unity. There was a time when people used to wait for the morning newspaper to know what’s happening in the world, but today, in an instant, YouTube videos, infinite tweets and Facebook updates start “trending” way before the news even makes its way to the newspaper editor’s desk. 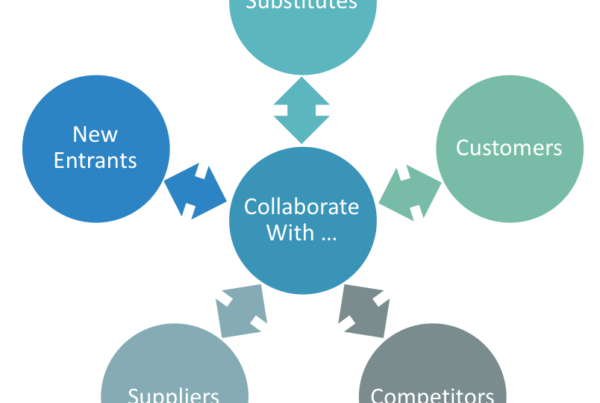 Co-creation is a very simple idea: it brings together independent parties, such as a company and its consumers, in order to jointly produce a valued product. For example, Nike provides online tools to the customer to design their own sneakers. Co-creation is not just limited to product design but even expands to the creation of marketing campaigns as well. Recently, Converse persuaded a large number of loyal customers to come up with their own video advertisements for the brand. Also, Frito-Lay has successfully crowd-sourced advertising for their Dorritos brand from consumers for their Super Bowl commercials. In doing this, companies try to tap consumer insights at the right point in innovation process. Co-creation enables brands to leverage consumers to do things for free both to promote as well as to produce, and, yet, the product ownership remains intact. Brands have also started engaging consumers in brand promotions. It isn’t a one-sided communication anymore- the consumer has become a part of content creation and brand promotion, similar to the functions provided by advertising agencies. The voice of customer today is being recognized, appreciated and leveraged by brands to deliver better products and services, and to promote them. While Social Media has placed much power in the hands of users for positive purposes, such as social activism and fandom, it also has also given rise to media deviancy. Every technology has its pros and cons, and Social Media is no different. When there is too much freedom, as there is on the Internet, security is at risk especially when there is no one to manage it. Government and lawmakers have been the late adopters of technology and the legal system is slow to adapt to the new technological environment. All this makes the system and people more vulnerable to risk. For instance, recently there have been multiple cases of frauds and crimes erupting out of Social Media, in such a case Social Media will be a more ‘social devil’. The rise and widespread adoption of Social Media has changed society dramatically. In just a few years, Social Media has gone from a platform for young people to connect, to the lifeline of Internet users. 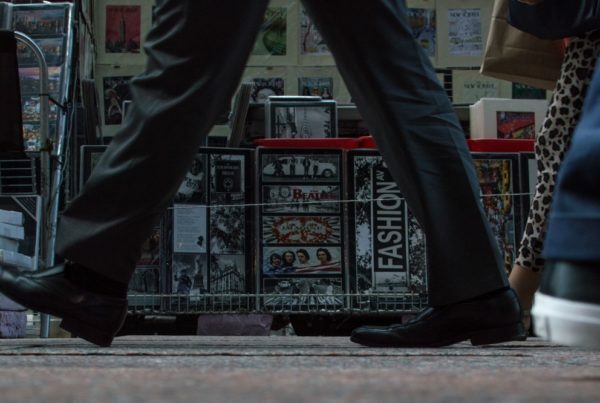 Because of its pervasiveness in society, Social Media has also affected the way marketers connect with consumers and, in turn, the way consumers connect with brands and products. In fact, Social Media is a much more powerful force than radio and television. Marketers must learn to swim in these unchartered waters of Social Media and ensure how to reach the shore. Social Media will have an enormous impact on shaping the future of consumption culture. While Social Media benefits society in a number of ways, not all of the transformation it has brought about has been positive. In many ways, it is a double-edged sword, providing both positive value and negative repercussions for society. Social Media addiction and deviancy are real issues, which should be addressed. Marketers should be cognizant of the fact that Social Media allows users to alter a brand. Marketers must not only respond, but also proactively share Social Media to be a positive force for society. In sum, Marketing Media will be permanently transformed by Social Media.